Handmade bracelet made with 6mm matte faceted Onyx beads, featuring 925 Silver shark and 2 pieces 6mm black spacer beads. It's adjustable, utilizing a sliding knot made with macrame cord and is easy to put on and take off by yourself. Handmade bracelet made with 5mm gray snake hematite Beads and 925 Silver shark. It's adjustabl.. Handmade bracelet made with 8mm Blue Variscia beads, featuring 925 Silver shark. It's adjustab.. 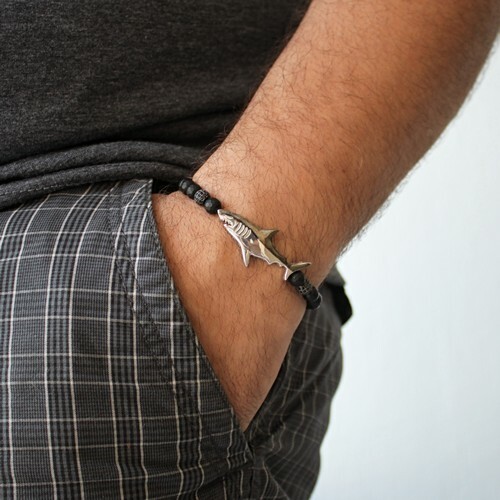 Handmade bracelet made with Chevron Hematite beads, featuring and 925 Silver shark. It's adjus.. Handmade bracelet made with 8mm matte faceted Onyx beads, featuring and 925 Silver shark. It's .. Handmade bracelet made with 8mm Aqua Blue / black jade beads, featuring 925 Silver shark. It's ..